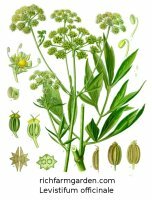 Lovage (Levistifum officinale) Perennial - Culinary, Medicinal - Lovely clusters of bright yellow flowers on fernlike foliage (resembles the leaves of celery). Dried seeds are used to flavor cakes and to scent perfumes. The leaves are used in salads and to replace meat stock in soups, or are candied like angelica stems.